911 procedures Broadcast Emergency Notification Articles for Emergency Alerts and Community Warnings. from: www.911dispatch.com - please visit this website for more 911 emergency related articles and information. When the 9-1-1 number was inaugurated in Haleyville (Ala.) as the result of an AT&T proposal, it was intended as an easily-remember, no-coin method of reaching the correct law enforcement, fire and EMS agencies. However, since 9-1-1 procedures are under the control of local agencies, many different policies have developed for the proper use of 9-1-1 since it's first use. Today, officials estimate that over 270,000 calls are made to 9-1-1 each day in the United States. Although the term "9-1-1" has come to mean the entire public safety communications system, in fact, it's simply a dedicated telephone system for relaying calls from the public. It is not the only method of reaching the police, fire or EMS agency, nor does it include many other telephone, radio and computer systems that an agency relies upon to communicate. A 9-1-1 system is considered either Basic or Enhanced. A Basic 9-1-1 system provides three-digit dialing, no-coin is required from pay telephones and intelligent routing to the Public Safety Answering Point (PSAP) that handles the area where the phone is located. An Enhanced 9-1-1 system adds the ability to display the caller's address and telephone number at the PSAP for the dispatcher's reference. Some 9-1-1 systems also have the ability to automatically ring-back the caller on hang-up, to lock a line open for tracing, or the ability to transfer callers to other agencies or telephone numbers with a single button. For further information on 911, see the e911 glossary. In general, 9-1-1 is an emergency number for any police, fire or medical incident. Some jurisdictions allow citizens to dial 9-1-1 for any type of police, fire or medical situation. In some cities, this has resulted in a flood of 9-1-1 calls that agencies cannot promptly receive, answer or respond to. The following section describe the Do's and Do Not's of 9-1-1 under its original "emergencies only" purpose. If you live in a region that is subject to natural disasters (earthquake, tornado, hurricane, etc. ), pre-plan a method of communicating with family, friends and relatives before an incident occurs. 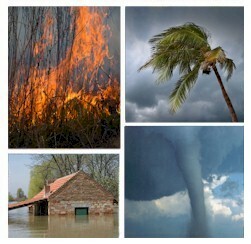 Choose any emergency contact outside the area that will be affected by the disaster. Make them the relay point for those who want to contact you. After the disaster hits, you can make just one telephone call to your contact, and have that information relayed to all those you care about. Do not dial 9-1-1 for a non-emergency. Instead, dial the agency's listed 7-digit non-emergency telephone number. A non-emergency incident is a property damage accident, break-in to a vehicle when suspect is gone, theft of property (when suspect is gone), vandalism (when suspect is gone), panhandlers, intoxicated persons who are not disorderly, or cars blocking the street or alleys. Do not pick up the telephone and put it down if you don't hear a dial-tone--you'll tie up the telephone network and delay obtaining a line. Stay on the line until you hear the dial-tone. If you hear a fast-busy, all circuits are busy--try again later. If you reach a recording, the telephone system isn't available for your call--try again later. In many large cities, 9-1-1 calls are answered by a dispatcher if one is available. However, if all call-takers are busy on other calls, the 9-1-1 call is answered by a call distributor that holds the call, and then automatically routes it to the first available call-taker. Do not hang up if you reach a recording, and try to call back. Stay on the line and your call will be answered in order. If you hang up, your call will be delayed because you will be placed at the end of other callers. Your 9-1-1 call will automatically routed to the police, fire or EMS agency that handles the area where the telephone is located. In general, 9-1-1 calls are answered by the area's law enforcement agency, who either handles the call or transfers it immediately to the appropriate agency. If you dialed 9-1-1 in error, do not hang up the telephone. Instead, stay on the line and explain to the dispatcher that you dialed by mistake and that you do not have an emergency. If you hang up, a dispatcher will call back to confirm that there is no emergency. If you don't answer, a police officer or deputy must be dispatched to confirm that you are OK. This will needlessly take resources away from genuine emergencies. Briefly describe the type of incident you are reporting. For example, "I'm reporting an auto fire," or "I'm reporting an unconscious person," or "I'm reporting a shoplifter." Then stay on the line with the dispatcher---do not hang up until the dispatcher tells you to. In some cases, the dispatcher will keep you on the line while the emergency units are responding to ask additional questions or to obtain on-going information. If your call is answered by a law enforcement agency and you are reporting a fire or medical emergency, the call-taker will transfer your call---stay on the line while the call is transferred. The call-taker who answers will need information about the incident. Let the call-taker ask you questions---they have been trained to ask questions that will help prioritize the incident, locate it and speed an appropriate response. Your answers should be brief and responsive. Remain calm and speak clearly. If you are not in a position to give full answers to the call-taker (the suspect is nearby), stay on the phone and the dispatcher will ask you questions that can be answered "yes" or "no." Cellular 9-1-1 calls are frequently routed to a central PSAP that could be many miles from your location. Be prepared to give the dispatcher your complete location---city or town, address or location, inside or outside, what floor or room, etc. Be patient as the dispatcher asks you questions. While you are answering the dispatcher's questions, he/she is entering or writing down the information. If you are reporting an emergency, most likely a response is being made while you are still on the line with the dispatcher. If you are able and have training, apply first aid to any patients who need it. Give the victim reassurance that help is on the way. Secure any dogs or other pets that may interfere with the emergency response. Gather any medications the patient is taking and which the medical crew will need to take with the patient.